It features portability with a safety closure hook, quick set-up and fold-down for storage, and lock automatically in open position for sturdiness. 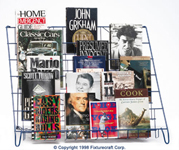 Strong, lightweight welded wire display racks hold over 8 times their own weight! Overlapping, undivided shelf design reveals the top 3½" to 4½" of your product, for maximum visual impact. A built-in sign holder bracket makes customization a snap.